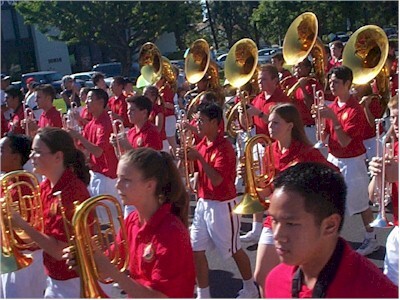 Matt marched in a parade band for the first time last week. He might have had the chance to march last year if he hadn't fractured his spine back in September. Fortunately, this is not one of the many activities from which Matt is banned. The Mt. Carmel band sounded great, playing their fight song, which, according to the guy who was sitting next to me, is the same song that the University of Southern California uses. I'll have to check that sometime.